Hearty, yes. Healthy? Not so much. Should I feel guilty about my blatant love of bacon? Should I look at the floor in shame the next time I see a sausage? I think not. Sausages are awesome and the English are not alone in their affection for them. The Spanish, the French, the Germans and even the Greeks produce their own types of sausage using a range of ingredients and techniques. There are sausages on every continent and over four hundred and seventy varieties of sausage in England alone. 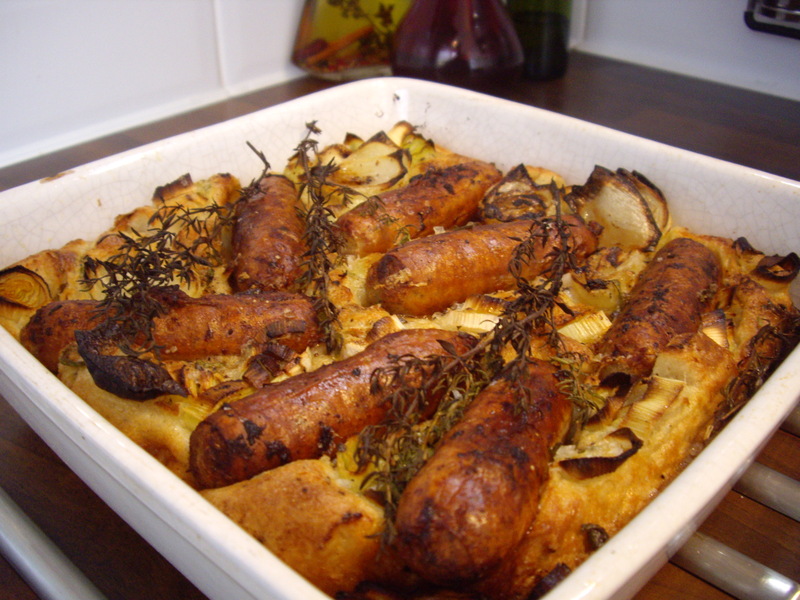 Among my favourites, Cumberland sausages stand out, but today I chose to use Linconshire sausages in a famous dish called toad in the hole. I say famous, but it’s the title that has made it so, rather than the qualities of the dish itself. Perhaps I’m being unfair because it can be a very tasty dish. I’d love to tuck into this on a cold winter evening when the wind is whistling through the trees and the tiles on the roof chatter like teeth in the storm. Ahem, where was I? Ah, yes, sausages in batter. I’ll be perfectly honest, I had never made toad in the hole before this and there was a certain amount of trepidation when I made the decision to try it out. How hard could it be? Batter, sausages, cook until golden. Surely everyone can manage that! I decided to brown the sausages first in the frying pan before adding them to the baking dish. It should be a one pot wonder, but I don’t like pale sausages. I fried the sausages on the lowest heat for about fifteen minutes until browned and cooked through. I then beat the egg with the water and made a thick batter by adding it to the flour and whisking. I ground some black pepper into the batter. For me, this is almost a reflex action and sometimes I have to stop myself adding pepper to things! I had to prepare the herbs and vegetables which gave me some time to heat the oil in the dish I was to cook the toad in. I chose a shallow, square dish, but it doesn’t matter too much as long as you can get all your sausages in and get the oil hot enough. I set the oven to the highest heat possible and put the dish in the centre with enough oil in it to just cover the base. The oil needs to be smoking hot. When the oil was ready, I removed the dish from the oven, poured the batter in and then began to arrange the ingredients. I started by placing the sausages in the batter and then spread out the leeks and onion. Next, I pushed the halves of garlic here and there and sprinkled the sliced sage over. I finished off by laying the sprigs of time across the batter and sprinkled a generous amount of sea salt over the whole dish. This all had to be done in a matter of seconds so as not to let the oil cool. Straight back into the oven for 30-40 minutes. Once the top was golden and the onions beginning to burn, I took the toad out and served it with peas and roasted carrots. Gravy? Of course.